Browsing in my local wine shop, a bottle of white caught my eye. 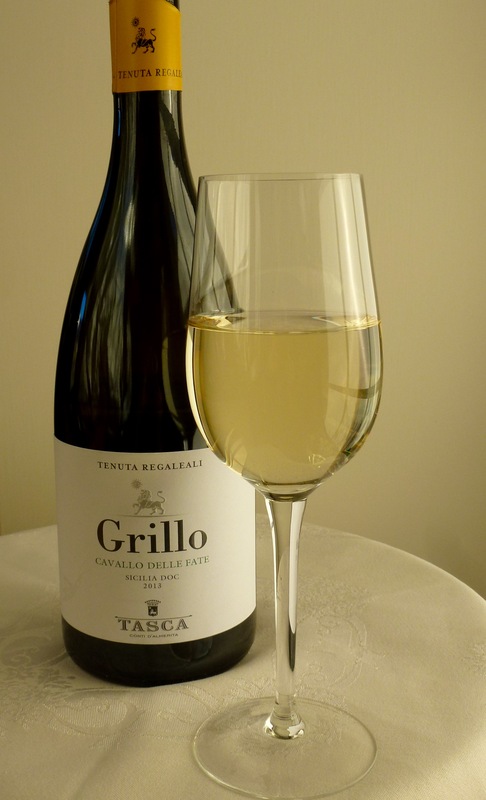 I also had never encountered the varietal Grillo, which means cricket in Italian, so I was doubly intrigued. Golden in color, this vino is aromatic with hints of citrus. It’s a sumptuous dry Italian white for summer times. I learned the back story of this indigenous Sicilian grape on The Wine Hub blog. Once the primary varietal used to produce fortified Marsala wine, it has largely been replaced by the higher yielding Catarratto. Happily, it’s being revived by modern vintners. Do you know of an Italian white that veers from the standard pours list? Share it here! Is 2015 the year for your Tuscan dream to come true? Escape with SimpleItaly to the private Villa Pipistrelli! Few experiences are as memorable as sharing time and a spectacular destination with an intimate group of friends, colleagues, or grown-up family. This intimate curated adventure is all about cultural immersion, relaxation, and good times. You’ll feel as if Villa Pipistrelli is your home because you’ll unpack once and “move in” for a week of wonders . . .
• Pecorino cheese-making demonstration and tasting. • Olive oil comparison blind tasting. • Pasta making session and tasting. • Wine estate tour with tasting. • Magnificent medieval Siena—home of the Palio—and a private tour of the Brucco contrada with author Dario Castagno. • Outing to the stunning hill town of Montepulciano. • Presentation on the restoration of Villa Pipistrelli conducted by antiques expert Susan Pennington. • Lavish buffet breakfasts and gourmet evening meals prepared by a private chef at Villa Pipistrelli. • Free time to explore Montestigliano, the 2,500-acre Tuscan estate on which Villa Pipistrelli is tucked away. • Social time with author Jennifer Criswell and other English-speaking experts on the culture, cuisine, and lifestyle. 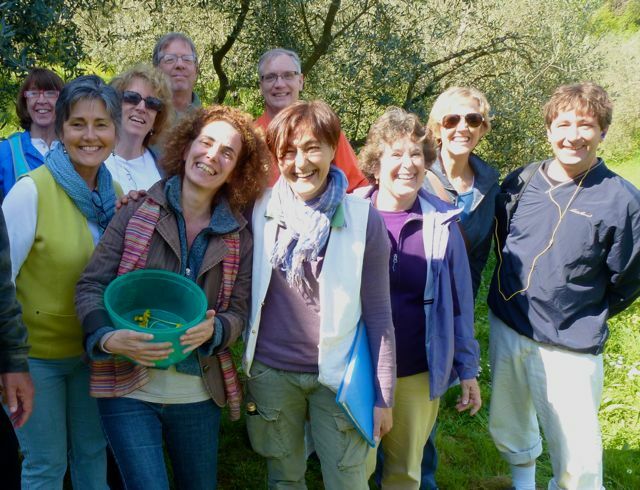 Click here for the full itinerary to make 2015 the year for your Tuscan dream to come true! 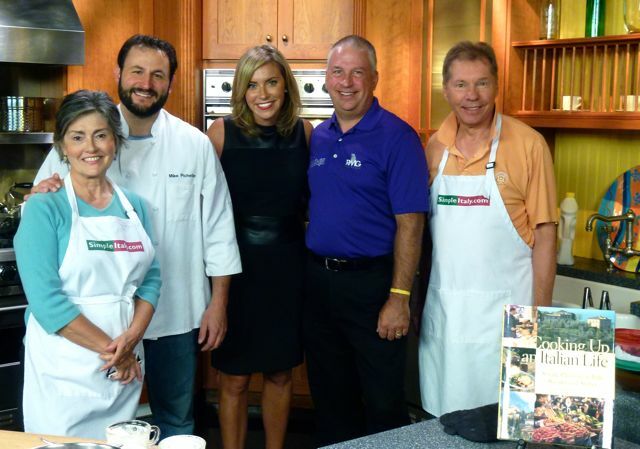 Sharon Sanders (L-R), Chef Mike Pichetto of Vintage Restaurant and 3rd & Ferry, Eve Tannery, Ron Martin, and Walter Sanders in the WFMZ-TV Sunrise Kitchen. This morning, Chef Mike Pichetto of Vintage Restaurant and Wine Bar, and SimpleItaly’s Sharon Sanders cooked up a sneak preview of the sumptuous dinner that will be served at the RMG Insurance Golf & Gourmet event to benefit the State Theatre Freddy Awards on Thurs., Sept. 18 at the Club at Morgan Hill, Easton, Pa. Chef Mike prepared Gorgonzola Chicken Thighs with Braised Red Cabbage and Sharon made Panna Cotta with Caramel Sauce and Raspberries. 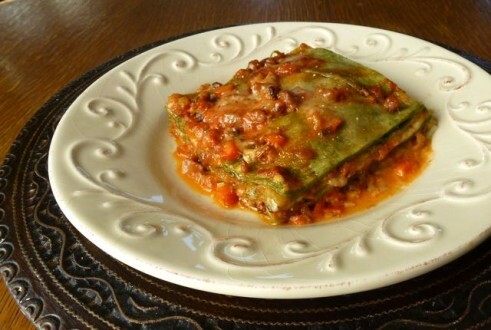 Both recipes are from Cooking Up an Italian Life. We were in the WFMZ-TV kitchen with News at Sunrise host Eve Tannery and Ron Martin, the maestro of the annual charity event, from RMG Insurance. Click here to watch the segment–Sharon’s demo follows Chef Mike’s–and get the recipes! 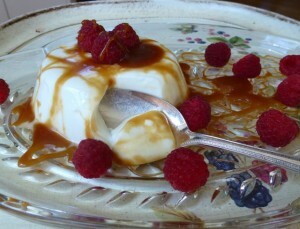 Creamy Panna Cotta is the dessert equivalent of a white silk blouse. Here, it’s accessorized with caramel drizzle and fresh raspberries. Escape from the snow, cold, and ice with a fun, interactive pop-up pasta cooking class with Sharon Sanders, Certified Culinary Professional, and Walter Sanders of simpleitaly.com. The small classes (maximum of 10) in a welcoming home kitchen (Center Valley, PA) are an intimate experience. You’ll learn to make, roll, and cut fresh egg pasta dough by hand-cranked machine, as well as prepare, and pair, three sauces for both fresh and packaged pasta. 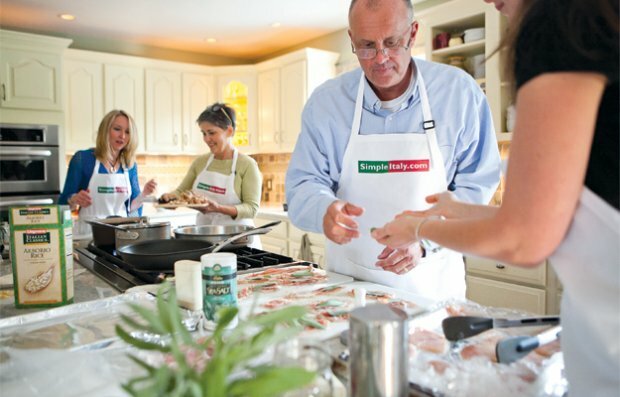 You’ll also receive an inscribed copy of Cooking Up an Italian Life and a SimpleItaly.com chef’s apron. And, of course, you’ll sample all the pastas you’ve prepared! Sunday, March 9, 2 p.m.
Thursday, March 13, 4 p.m.